ver useful correlations. Still others can create self-learning systems that find patterns and anomalies, and determine how best to take action. They are all literate, but to varying degrees. 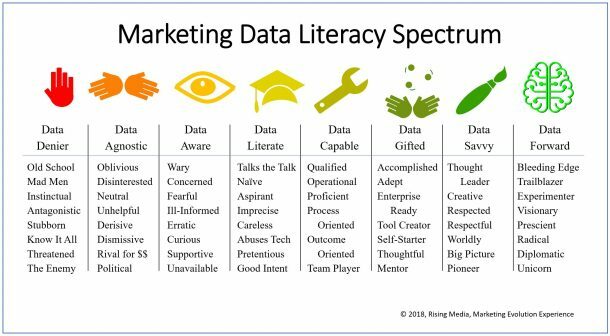 The data illiterate are going to find it more difficult getting along in the world of marketing. ted by solid data, the rest of the firm will follow suit and make a point of having the numbers to back them up. Email personalization, search engine optimization, A/B-split tests, and customer segmentation are up and running. 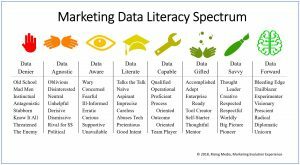 The Data Capable have grabbed on with both hands and are optimizing specific marketing functions with people, process, technology, and data. They make it possible for the CMO to say, “Yes, of course we have a full Conversion Rate Optimization program in place and form-abandonment analysis. We can even account for seasonality, geo-targeting and social media influencers.” But the CMO admits that Customer Lifetime Value is tough nut to crack and that they’re only using Net Promoter Score so far. Pushing the outside of the envelope! The Data Forward are killing it with data and showing the rest of us what tomorrow may bring. These are the ones I want on the Marketing Analytics Summit stage, showing you how they did it. Wherever your organization may be on the Data Intelligence Spectrum, get them to the next level by forwarding this email and to the Marketing Analytics Summit.